Our next stop is only 6 miles up the road, so we took our time getting loaded up. 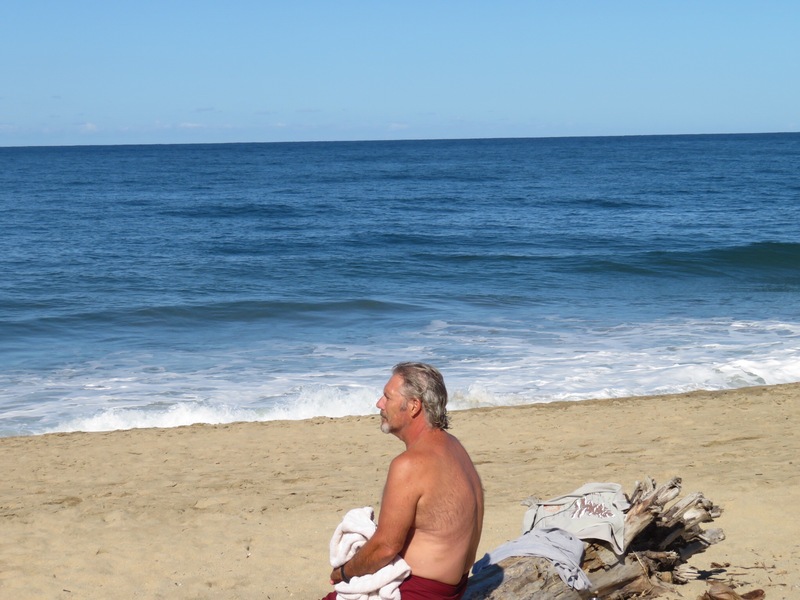 Took a plunge in the rough shorebreak out front, then came back for outdoor showers at the campground. The water was pumped to a cistern up in the trees and then the water came out in a narrow stream from the rusted piece of pipe attached to the bottom of the tank. It did the job, so clean and fresh we worked our way through the narrow cobblestones back out to the main highway. Along with a number of cars, we found ourselves lined up behind a big slow moving truck. The windy jungle road and the constant oncoming traffic, made passing impossible. That was o.k. by me. It allowed us to cruise at an easy pace without being blamed for the obstruction. 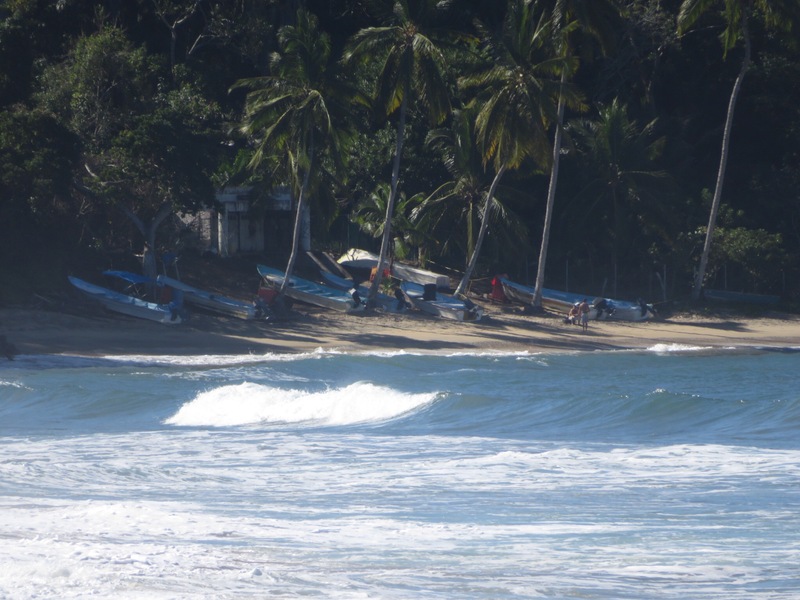 In short order, we were turning down the road to Sayulita. Nasty topes and lots of them. Tons of traffic both going in and coming out. The road is under construction, so the main entrance was closed down. 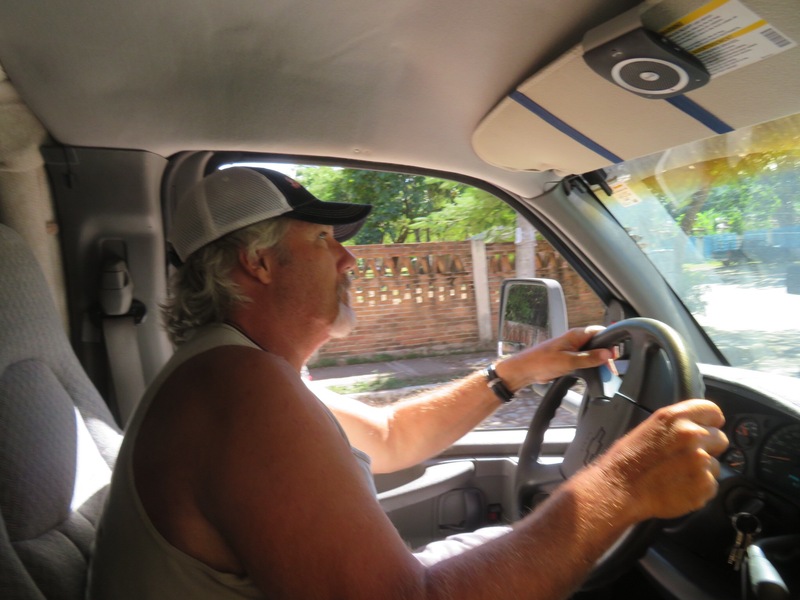 We drove forward a ways with some other cars, then stopped and asked for directions to the RV park. “Do you know how to get to the RV park?” I asked. “Yeah” the cool gringo kid hanging around leaning on the pick up with his hip friends answered, but offered no directions. One of the other dudes spoke up and gave a rough idea on how to get there. We turned down the side street and it soon narrowed into tiny cobblestone ways with trees hanging into the road, cars parked up on both sides and oncoming trucks and cars that gave no room to pass. It got really hairy when the road led downtown where the restaurants put their tables halfway out in the street, golf carts were double parked and throngs of tourists walked the center of the street. 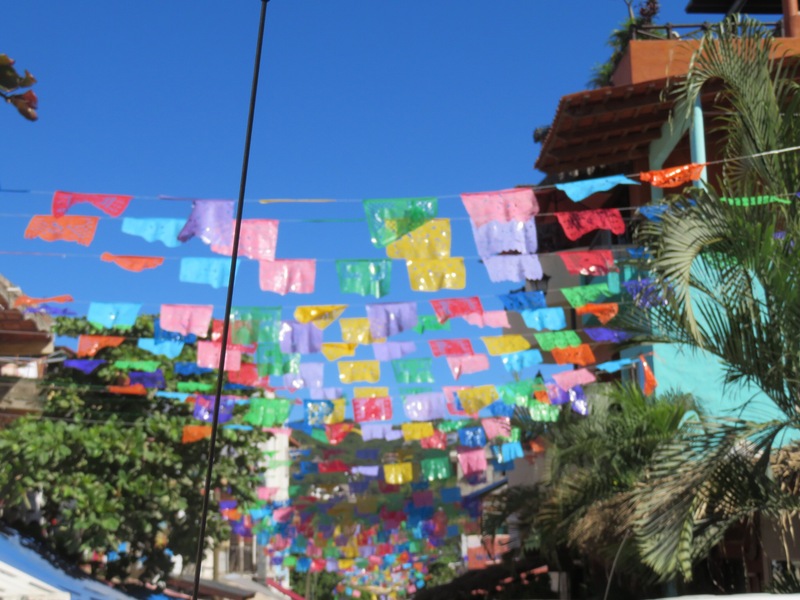 Packed but festive with banderas hanging overhead and colorful restaurants and shops lining the road. Definitely not made for RV travel though and some of the stares proclaimed as much. 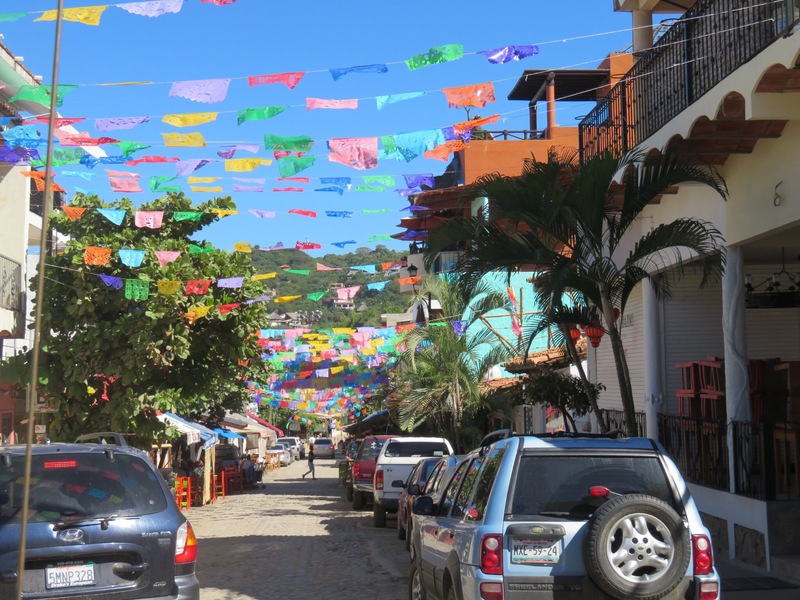 Sayulita is a mass of humanity. Every form of tourist, local, part time local and wannabe local flooding the streets in a never ending spring break. We made it to the RV park okay to find that they had no spaces available. Asked about alternative camping, but got only shrugs. So we turned around and headed back up the street. A local guy was hitchiking out so we loaded him in and drove on. Arturo said he knew a back way and took us on a dirt road that ended following a trench with two low trees that we couldn’t get past. We had to back up skirting the trench with a line of angry cars waiting for us to get out of the way. 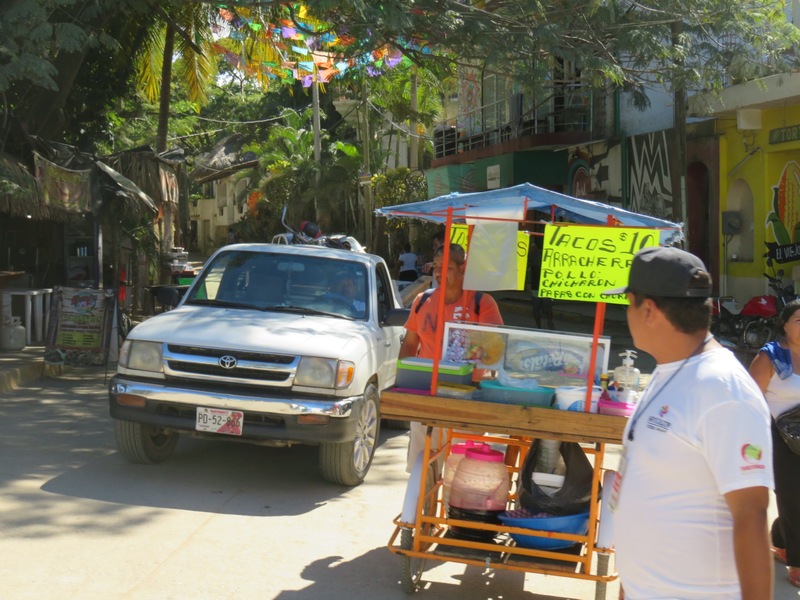 We provided the afternoon entertainment for the locals eating lunch at the birria stand. In the end, the only way out was the way that we came in. So, back we went through the center of town and back along the invisible speed bumps out to the highway. Things were banging and flying around inside. Half the spices were out of the rack and on the floor. Took a few minutes to regroup at the Oxxo out at the intersection with highway 200. We’ll have to come back when things slow down a little. 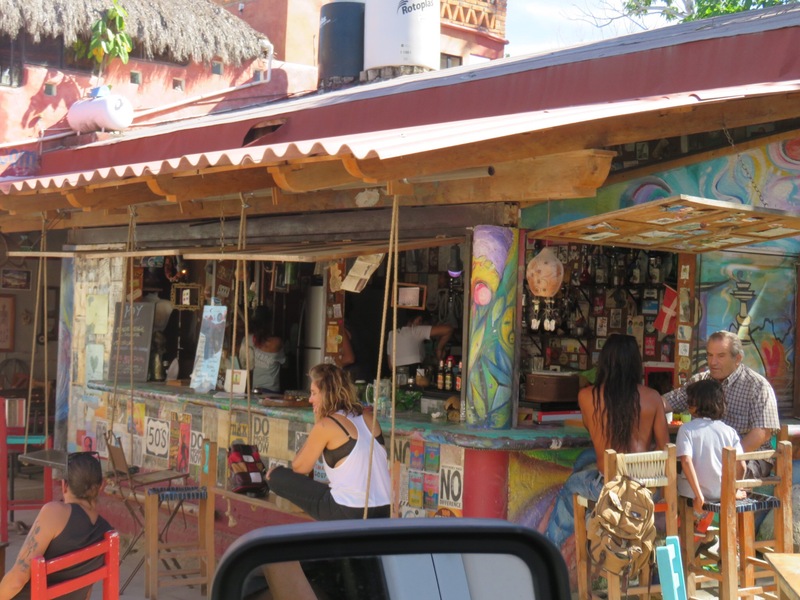 Thought we might check out the Punta Mita area so I called the trailer park Los Arroyos Verdes in Bucerias and they said they had a spot, so we saddled up and continued on towards P.V. I got my first taste of driving in the lateral lanes, making a left turn from the far right lanes. Found Los Arroyos easy enough and they sent us down to the far gate for the RV sites. Had to scrape up against a bunch of overgrown trees getting in. Obviously the RV section sees very little use. We were the only RV there besides a little tear drop trailer that was being stored there.